This is a really fun idea that was inspired by SUPERMOM MOMENTS. Sometimes it’s hard to find Valentine ideas for boys, but these are sure to please even your toughest Valentine critic. Plus, they come together really quickly, so even if you’re a last minute mom you have time to pull this off! 1. Download the printable below. 2. Have your child sign his/her name on the back. 3. Buy the baggies that you use for hard suckers. You can buy these at most craft store where the sucker molds are. 4. Buy a whole slew of bouncy balls and fold paper in half then staple them together. 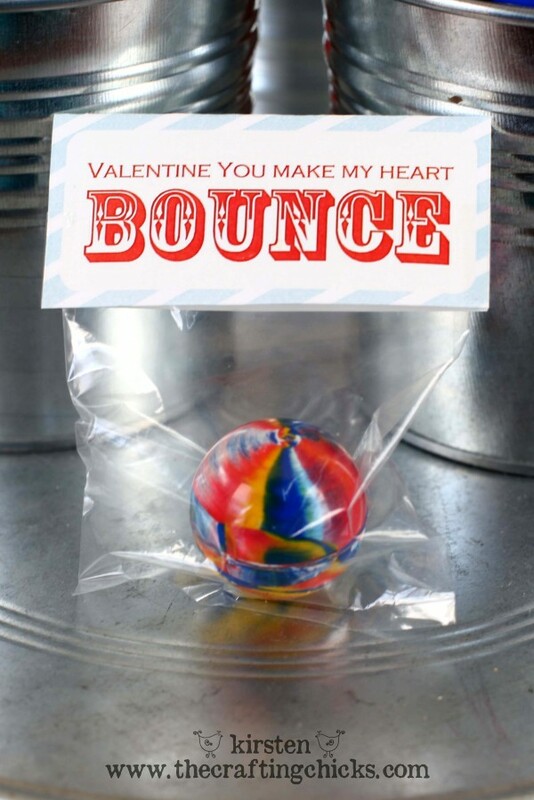 Best of all, these don’t include pink or hearts, so the boys will be happy to give and receive this Bouncy Ball Valentine! All printables are property of The Crafting Chicks, LLP. For personal use only. Not to be sold or for commercial use. What are your fun Valentine ideas? Hey, this does look like fun! Thanks for sharing. Adorable. I have already done my Valentines for this year but I’m definitely making these next year. Thanks for the freebie! Still isn’t working for me! It does download, but will not allow an option for printing! I didn’t mean to have an exclamation mark at the end of that last sentence lol. I realize it does make me look angry 🙂 Super cute printable though! Hope others were able to make it work! Oh no! the link doesn’t work! These are sooo super cute I would love to use these!! I know it’s the last hour, but the link is fixed 🙂 So sorry, I am out of town. Happy Valentines Day! This is a super fun idea. I will have to bookmark it for next year. Thanks! You’re right, it’s so hard to find good boy Valentine stuff. Love this idea and the tag is great! Thanks so very much for sharing. 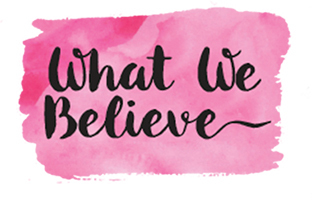 I just love this site, I’m a Sunday School teacher who can use new ideas, and am happy to find The Crafting Chicks! I love working with paper! Thanks for sharing so many great ideas! Super cute! Thanks for sharing!!! I can’t get the link to work. Help! Is there any way you can email the file to me? I really want to use this but can’t get it to work. Thanks so much! Love this idea, but I cannot get the link to work either. Link: If the link is coming up blank, still click the download and the file will show up. Good Luck!! We are so making these tomorrow! THank you Thank you Thank you! LOVE it!!! I love the non candy valentines!! Thanks for sharing! Thanks! Loved this. My kids made a bunch for their valentines this year. My son made and brought these to his class today. It was way too fun being the photographer with 25 kids bouncing their bouncy balls in the class room! Even the teacher had fun. Thanks for the mischief!! Hello, this is super cute and super smart! But the link doesn’t seem to work for me either. I would love to do it for this Valentine’s Day. Hopefully if you have time you can send me the file. I to love this idea but can’t seem to get the link to work! This is a brilliant idea! Where did you get your bouncy balls from? I’m having trouble finding cute ones on amazon & oriental trading. Thanks! Link is saying google docs is not working right now? Any answes. its super cute! Could you tell me what size of bouncy balls you used and where you found them? Link problem! This is so super cute for boys! Hope to get to use it! Bouncy balls are in their bags. Just hoping to get this link to work…HELP! Can you e-mail me the Bouncy ball cards, I can’t get it to print correctly off of the link. It is super big and it doesn’t even get one card on a piece of paper. Link takes me to a error page from Pinterest? Love this Valentine and hope to use it. My son wants to have these as his valentines. The link goes to pinning it on pinterest. I did that, but it doesn’t give you the printable. Please help. Thank you!!! This link sends me to an error page on Pinterest. So sad 🙁 I bought the balls and bags already. Hope it works in time for Valentines! The link isn’t working for me either, but if you click on the picture it shows it to you large enough that it should work if you right-click the image and save it. (At least, I think it’s high-res enough to still work as a printable.) Hope that helps someone. Thank you for the cute idea! I, along with the other ladies above, was sent to Pinterest when I clicked on the link. Our bouncy balls are in bags ready to go as well. Would you mind posting a new link or emailing it? I just LOVE this idea – such a great non-candy Valentine that works for boys too. Thank you so much for sharing your idea! Link isn’t working… could you please email it to me, please? Sorry to be repetitive, but I am not able to print the download. The link works in the sense it allows you to view it, but not print. I am able to download the printable but it won’t let me print it. Seems the protection on it won’t allow it? I just copy and pasted the image above into a Word document and will print from there. I am also unable to print it as it is currently written. Thank you for this! I didn’t have any trouble printing this out. SO easy!! 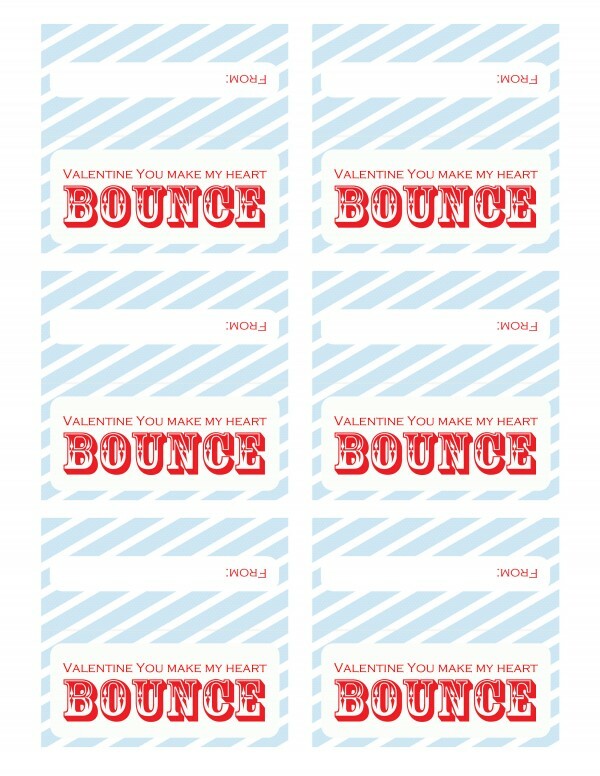 I have almost 100 valentines to make this year and this is so cute and so easy – and NO candy. 🙂 Thank you for sharing the printable. That was very generous and I am very grateful. Carolyn – What did you do. How did you get it to print? HEY…….to all of the gals that are unable to print correctly. Are you using Google Chrome Browser? IF you are…..that is your problem. Many things don’t print correctly through Google Chrome. Don’t ask me why 😉 Open a different browser: Explorer or FireFox and print. Or….look it up at work on a different browser and then save it to a drive or whatever and print at home. Chrome as a browser rocks, but as a printable platform……the communication just doesn’t crossover well. Good luck! I can’t seem to get the link to print. Anyone have a hint to share? Okay – I figured it out. Just needed a little patience. Happy V Day! Thanks for sharing this super cute idea. I Google image the doc, downloaded it, saved it, printed. This is a Google doc you can also download and print. Thanks for this~!! Worked perfectly. Once you’ve downloaded the file, you’ll have to unzip it before you can print. Hope that helps some of you! Love this idea, but I can’t print either. Using Internet Explorer, can’t “copy” to Word and cannot print from original download. Anyone with success, please share! I was able to open it and print once I figured out how to unzip it! Lol! Thanks! I can’t get it to print. How do you unzip it? Please help!! Super cute idea, it helps eliminate candy. Just double click on it 🙂 It will unzip into a new folder, which will have everything you need inside! When I double click on it, it asks to Open, Save, or Save As. So I save it to my desktop and it opens but cannot print it. It doesn’t Unzip for me, unless it’s user error, which could be the case! 🙁 I am really hoping to use this as I am ready to bag the balls for my 3 sons valentines party! Can you email it to me: [email protected]? I DID IT!!! I had to say Extract Files, then it took it out of the zip and into a different file. 🙂 Thank you so much for sharing your work! !